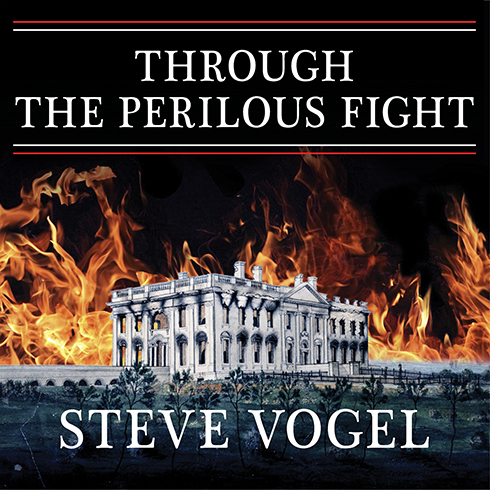 Through the Perilous Fight - Audiobook | Listen Instantly! In the summer of 1814, the United States of America teetered on the brink of disaster. The war it had declared against Great Britain two years earlier appeared headed toward inglorious American defeat. The young nation's most implacable nemesis, the ruthless British admiral George Cockburn, launched an invasion of Washington in a daring attempt to decapitate the government and crush the American spirit. The British succeeded spectacularly, burning down most of the city's landmarks—including the White House and the Capitol—and driving President James Madison from the area. As looters ransacked federal buildings and panic gripped the citizens of Washington, beleaguered American forces were forced to regroup for a last-ditch defense of Baltimore. The outcome of that "perilous fight" would help change the outcome of the war—and with it, the fate of the fledgling American republic. In a fast-paced, character-driven narrative, Steve Vogel tells the story of this titanic struggle from the perspective of both sides. Like an epic novel, Through the Perilous Fight abounds with heroes, villains, and astounding feats of derring-do. The vindictive Cockburn emerges from these pages as a pioneer in the art of total warfare, ordering his men to "knock down, burn, and destroy" everything in their path. While President Madison dithers on how to protect the capital, Secretary of State James Monroe personally organizes the American defenses, with disastrous results. Meanwhile, a prominent Washington lawyer named Francis Scott Key embarks on a mission of mercy to negotiate the release of an American prisoner. His journey will place him with the British fleet during the climactic Battle for Baltimore, and culminate in the creation of one of the most enduring compositions in the annals of patriotic song: "The Star-Spangled Banner." Like Pearl Harbor or 9/11, the burning of Washington was a devastating national tragedy that ultimately united America and renewed its sense of purpose. Through the Perilous Fight combines bravura storytelling with brilliantly rendered character sketches to recreate the thrilling six-week period when Americans rallied from the ashes to overcome their oldest adversary—and win themselves a new birth of freedom. Download and start listening now! Steve Vogel is a veteran print and broadcast journalist, columnist, and talk show host who covered every minute of the original trial described in Reasonable Doubt. With a BA from Illinois Wesleyan University and a master’s degree from Northwestern University’s Medill School of Journalism, he appeared on the American Forces Radio Network in Europe and later did commentaries on the Voice of America. His career has spanned print and broadcast news, radio programming, corporate communications, and newspaper column writing.